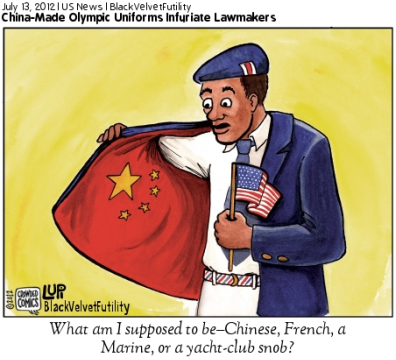 Are U.S. Congress member violating the Olympic spirit and expressing ‘narrow-minded nationalism and ignorance’ with their near-hysterical reaction to news that Team USA has uniforms made in China? This editorial from China’s state-run Xinhua points out that if Harry Reid and his Congressional colleagues are so angry about China-made products, they should start burning their clothes and smart phones now. It is astounding that words of such irresponsibility were spoken by a senior political leader. The Olympic Spirit, which has nothing to do with politics, embodies mutual understanding and fair play. By conflating uniforms with politics, U.S. politicians have revealed a narrow-minded nationalism and ignorance, violating the very essence of the Olympic Spirit. This fury over U.S. Olympic uniforms is just another case of the fierce and at times absurd political fighting that occurs on Capitol Hill, particularly in an election year dominated by issues of economic growth and job creation. Of course, common sense tells us that what really counts at competitive events like the Olympics is the performances of the athletes, not the origin of uniforms to be worn at the opening ceremonies. If accusations like these are justified, why doesn’t the U.S. Congress impose a ban on its members from wearing anything or using any product not made in America? READ ON AT WORLDMEETS.US, your most trusted translator and aggregator of foreign news and views about our nation.